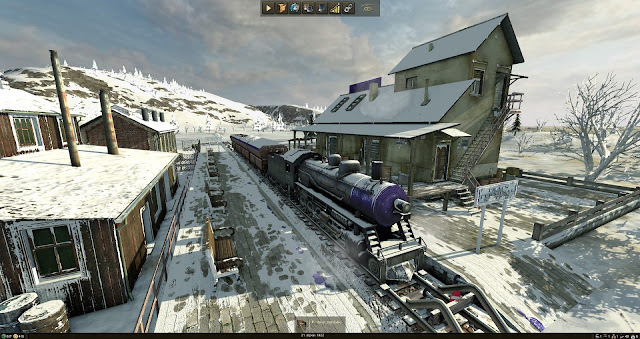 Mashinky has had more than 7 years in development as a side project from Mafia II,III and DayZ developer Jan Zeleny and after reaching the top 100 listings and heading towards a successful Steam Greenlight campaign on Steam, Jan hopes to make it a spiritual successor to Sid Meier's Railroad Tycoon series and Chris Sawyer's Transport Tycoon with plenty of expansive new features to bring the genre bang up to date. The Steam write up notes the game will combine realistic graphics with old-school construction mode with rules inspired by board games, Mashinky combines the best of both worlds: eye-candy of 3D visuals and addictiveness of isometric gameplay, adding its own unique vibe in the process. It also has procedurally generated landscapes and a low-poly edit mode coupled with a fully rendered runtime. Indeed the pre-alpha footage looks like an absolute peach, and you too will be able to play the game when it comes out through Early Access at the end of Q1 2017. Upgrades or customizations for everything including stations, industry buildings, depots and trains (by special bonus wagons). Challenging puzzle-like track laying possible to do flyover crossing, semaphore driven optimized railroad nodes. Sandbox variable quests and subsidies, scripted events. Multiplayer for up to 8 players on the map. This project has all the hallmarks of a passion project by someone who is well versed in the game production system, so this promises to be a real blessing to the genre. don't miss it if you're a fan of Train empire building sims.